So, as this is my first topic related post (yay!) 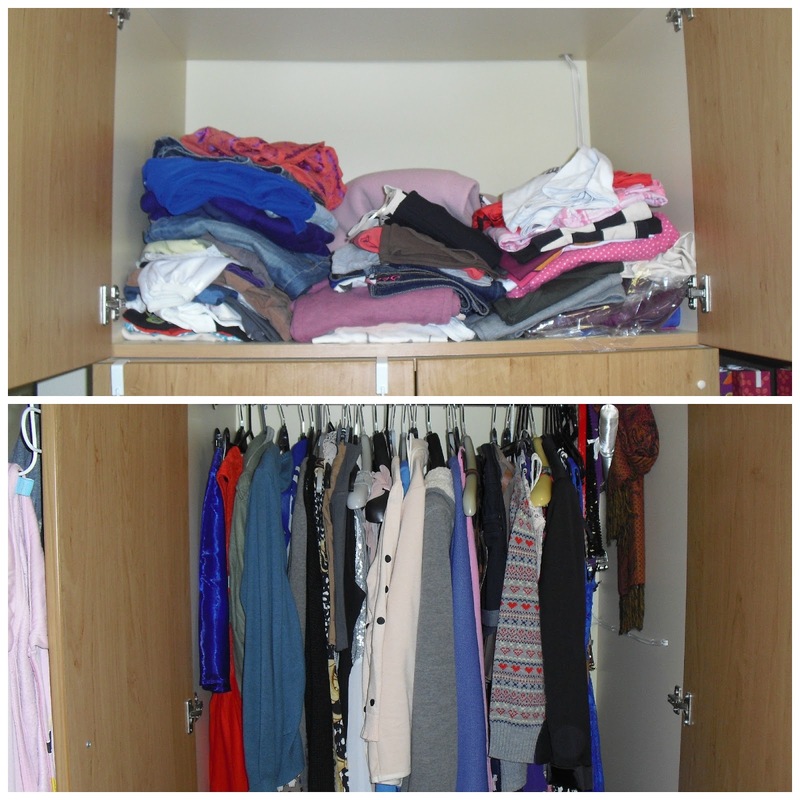 I thought I'd give you a look inside my wardrobe - well my uni one anyway. doesn't look like a lot of clothes in the picture but in reality I'm a clothes-lover! Oh and these aren't all of them, I still have a few at home. (I told you, you'd see I'm a shopaholic) In my eyes, you can never have too many clothes. I love my comfy clothes like trusty jeans, t-shirts, jumpers, cardis but when summer comes round I also love my skirts and summer dresses. In fact I have so many dresses, I've lost count. I don't really have a fave colour in clothes (as you can see) If I like something, I'll buy it no matter what colour and it's great to experiment with a bit of colour. As much as being on-trend is important for me, so is feeling comfortable. So when it comes to shopping and even picking an outfit in the morning, I always pick something I'm comfortable in. I think it's important for everyone to wear something that's not just on-trend but (oops, need another word comfortable) that they enjoy wearing. Anyone who knows me well, will tell you I never leave the house without a scarf one! I'm not sure why, I think I get so used to wearing one at winter and forget to take it off. Again, this is a very small collection because I had to selective for uni - yes, it was hard to choose. But I chose one for every season and weather - the thick purple scarf for cold winter weather, the thin white scarf for warm summer days (not that we've had many so far), the other purple scarf for those 'in-between' days or spring and the browny/orange one for those not too cold but turning colder autumn days. See, I told you I had one for every season, well I kind of made that up as I went along but I do genuinely have that many scarves they could be sorted for every season. Anyway, I do love my scarves, they keep my neck warm and add a bit of detail to a 'plain' outfit. When it comes to shoes I'm a typical girl - you can never have enough! My small uni collection is not the end of it (again, I had to be selective) Admittedly, I have even worn half of these shoes but yet I still keep buying. I've definitely become more of a 'shoeaholic' since starting university and I keep finding ones that I like! It'll never stop I know. Again, I've got shoes for every weather - quite literally - wellies for rain and snow, boots for the cold, dolly shoes for the warm and sandals (I have no idea why I bought them to uni, in this weather?!) for the hot days. I love my shoes but I've definitely got a fave - My Uggs! They're a bit of a selective taste shoe but I quite literally have no idea what I'd do without them - that's how much I love them! As you can see, I've worn them pretty well and the best thing is, they keep my feet toasty warm in the chilly weather. If you've got a pair or tried some on, you'll know they're unbelievably comfortable as well - a massive bonus compared to heels. 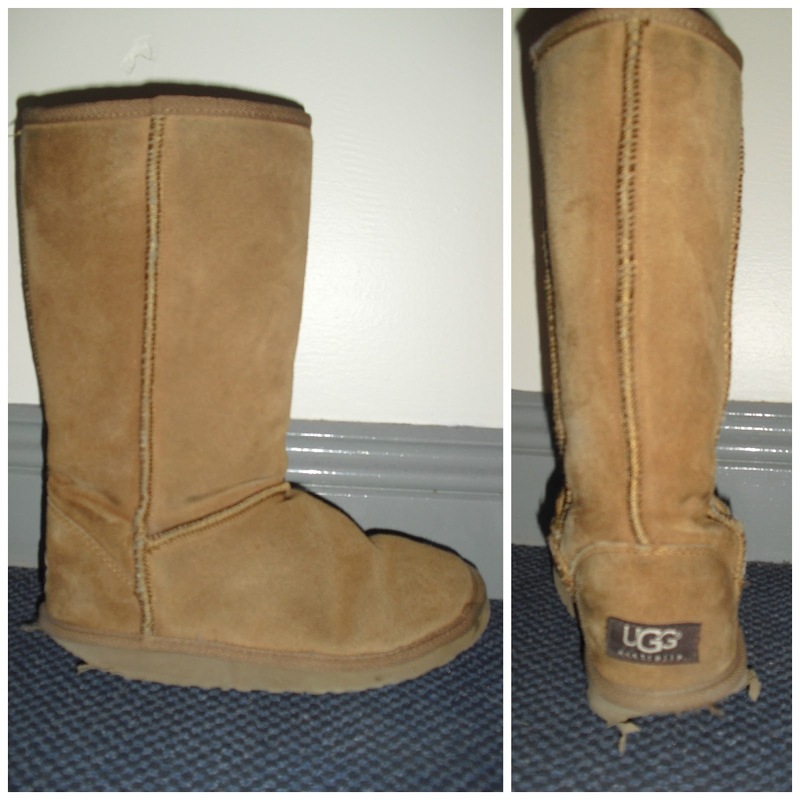 I always wanted real uggs, I'd gone through so many fake ones that when I saw the real ones in shops I fell in love. When I finally got them, words couldn't describe how I felt - the best thing was they were an unexpected present, thank you to my brothers - but I knew I'd wear them as much as I could. You may think it's sad but everyone's got/had one pair of shoes they've loved more than the rest - well these are that for me. I love my Uggs. Simple as. So, there you go. A little peek into my (uni) wardrobe. I'm sure you'll learn more and more about my style and taste as I post more and more but for now that's all you're getting. So, I hope you liked it and happy shopping.